Historically related can mean historical events. Logically related can mean related Torah concepts. Under the Torah Code Hypothesis, events which will happen thousands of years after the Torah came into existence are encoded in the Torah text. If the Torah does contain information about future events through the Torah codes, then why cannot the Torah codes be used to predict the future? There are two reasons why with the current methodology Torah codes cannot be used to predict the future. The first is a logical problem. The second is an incompleteness problem. Key words that are encoded imply a relatively compact table of their ELSs. However, a compact table of ELSs does not imply an encoding of the corresponding key words. Simply stated, there are many relatively compact meetings of equidistant letter sequences whose corresponding key words are not related in any meaningful way, let alone correspond to some historical event. This can be understood in a more formal way. In propositional logic, the proposition A implies B is not equivalent to B implies A. For example, if (A) something is gold, then (B) it glitters. This is generally true. On the other hand, if (B) it glitters, then (A) it is gold is obviously false. Thus, the folk wisdom: All that glitters is not gold. The problem is that although it is true that gold glitters, there are many other things that glitter too. Proposition A is key words of an historical event are encoded. Proposition B is will have a compact table of their ELSs. So if there is a major historical event, then the relevant key words will be encoded and hence there will exist a relatively compact table of its ELSs. However, to predict the future, a relatively compact table of ELSs must be found first. But a relatively compact table of ELSs does not imply an encoding of the corresponding key words even though an encoding does imply a relatively compact table of ELSs. If some words have equidistant letter sequences that are in a relatively compact meeting, then they are related to each other through some historical (or future historical) event. Thus, the concept of using codes to predict the future is logically flawed. The Bible code seemed to be predicting a new holocaust, the destruction of an entire country. Drosnin is clearly using a Torah code table to make a prediction that there is going to be a holocaust in Israel in the year 5766. And the danger is so real that he warned the Prime Minister of Israel about it. Well, 5756 came and went and there was no holocaust in Israel. So the prediction was wrong. As the year 5756 closed with no holocaust of Israel, Drosnin had to seek for an explanation of the inconsistency between what did not happen and what he thought his table predicted. He writes that he found the explanation. There was an ELS of another key word in the table, the key word, delayed. This would be Drosnin's open admission that incompleteness of key word sets trying to predict events is possible. His book was published in 1997 and details his interesting political adventures related to this incorrect prediction. However, there is another explanation, other than the holocaust being delayed. In fact, what the table is showing is the event published in his book: Drosnin thinks (thought) there is going to be a holocaust in Israel in 1996. 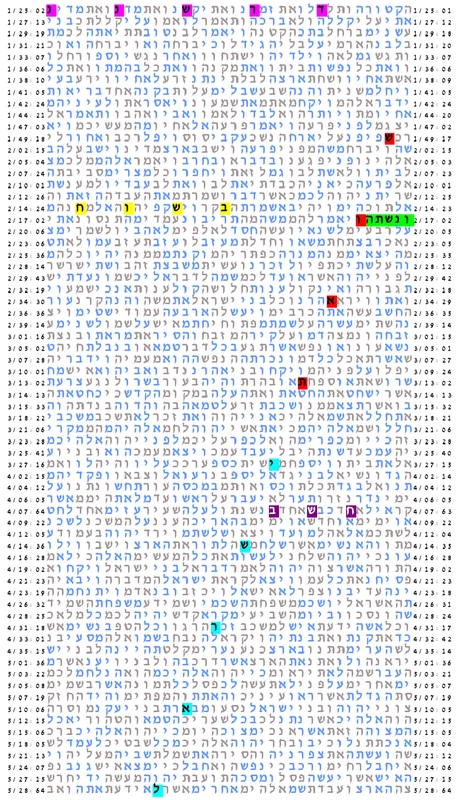 The table shown below adds to the table above the key words Drosnin with the spelling דרשנן, and thinks, חושב. In the table there is an additional key word thought, חשב. 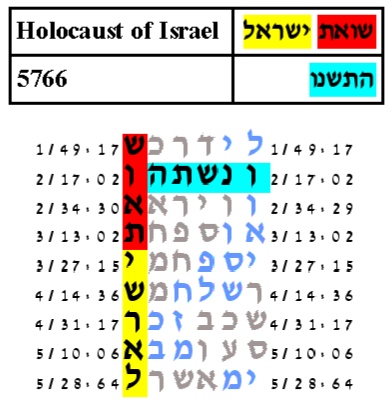 The Drosnin table having the sentence: Drosnin thinks holocaust of Israel 5766. Up to this point, we have not said anything related to the probability that the Drosnin tables could have happened by chance. After discussing the experiments by which such probabilities are computed, we will make some definite statements. We begin our discussion of probabilities by discussing the meaning of relatively compact.